There is just something about RIM's line of BlackBerry smartphones that make some people to do something to idolize the handsets in some fashion. Previously, we've seen a BlackBerry Tour happy owner construct a large sized replica of his handset out of LEGO pieces – with a plasma television thrown in for its display. Now we're going to see France lay claim to owning the world's largest BlackBerry which will basically display both messages and photos that are received through the message creator app on their Facebook fan page. 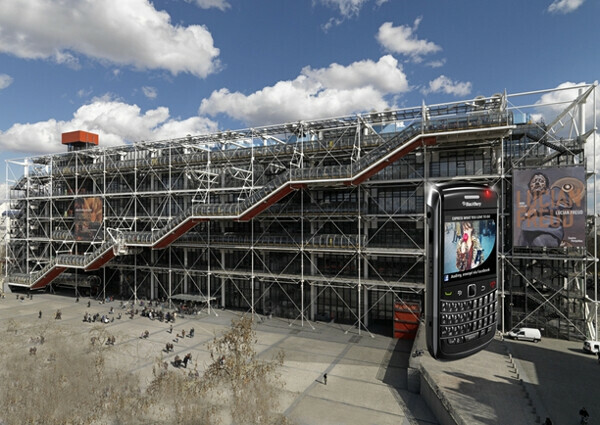 Towering at approximately two stories in height, the BlackBerry Bold 9700 like handset will be on display at the Beaubourg Esplanade in the center of Paris, France. So if you want the people of France to check out your personalized message, simply head on over to their Facebook fan page where it'll hopefully be broadcasted some time during May 20-22. Even though we don't suggest booking a plane ticket to witness your message come to life on the larger than life BlackBerry, you can always experience everything through their Live Stream on their Facebook page. Good way to spend money in a down economy.